Reprinted in 1998 by Ashe County Historical Society; 589 pages; hardback; out of print. 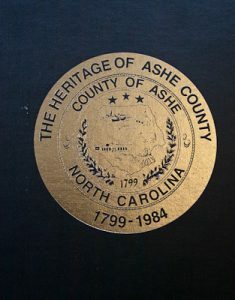 This book is essential for an understanding of Ashe County and its people. Articles describe in detail places, institutions and county events. Included are 675 families with their stories and photographs, submitted by members who wanted to record recollections and ancestral information. On Sale! Was-$86, now only $24.99.